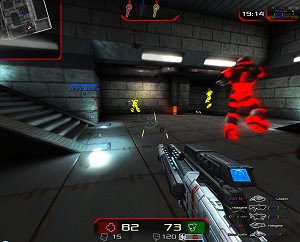 Xonotic is an open source FPS that follows in the footsteps of popular free-to-play game Nexuiz. This is an ambitious multiplayer shooter that includes the usual singleplayer mode against bots only to familiarize with the game world and the available maps. The futuristic setting is akin to the ones seen in games such as Quake or Unreal Tournament, with clean surfaces and many resources that make it perfect for fast-paced deathmatch battles. Xonotic is in continuous development and already offers several game modes and maps, but the team responsible plans to optimize the game even further and add more content.